HAVE YOU EVER WANTED TO HAVE SOMETHING YOU COULD JUST SPRAY IN THE AIR TO KEEP THE BIRDS AWAY, WELL THIS IS ABOUT AS CLOSE AS YOU COULD HOPE TO GET. Open-air restaurants, Amphitheaters, Retail Outlets, Transfer Stations, Recycling Plants, Airports, Military Installations, Land Fills, Open Air Malls, Warehouses, Hangars, Food Processing Plants and Much More ! � Non-obtrusive � it�s invisible! Arizona Wings N' Stings recognizes that each site is unique in need: by geography, by climate, by function, and by numbers and species of birds. We administer technologies and procedures to match the requirements of each site and species of birds which could include hazers, netting, shock systems, bird spike or other guaranteed effective methods. < Bird Buffers - (as seen here) and other Pigeon and Bird Hazer Systems are designed to protect your facility from unwanted birds. A modular system, the components are easily placed where you need them, and often the compressor is hundreds of feet away in an equipment enclosure. A small building might use one AviHaze module, open air patios/ eating areas many need 2 or 3, large industrial plants or public attractions could place dozens of modules depending on the coverage needed and the type of bird you are trying to evict. Keeping birds away is safe and easy with the new nearly invisible haze that birds can�t see. The haze doesn�t harm them or anyone else, but creates an invisible barrier that birds smell - well birds don�t really smell, they have a trigeminal nerve that is affected by the MA thus the reason they don�t like it. It works both indoors or outside. The best part is, birds remember the bird hazer is there to guard your facility, and they stay away. The nano-particles are about 5 microns in size in the air generated by the Hazer Generator System only has an effect on birds. This is called �Avian Specific or only birds.� The birds become sensitive to the area where the haze is floating, Because the nano-particles are invisible, the birds do not understand why they don�t like the area and relate this to that area as �not comfortable� and so they stay away from that location. WHAT IS A PIGEON or BIRD HAZE GENERATOR SYSTEM? The Bird Haze Generator System produces nano-particles made from grape juice and soy concentrate that is listed as completely harmless to birds, animals, people and is classified by the USDA. 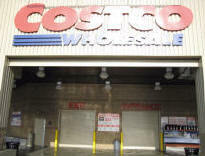 Cosco has started to use Bird Buffer units around the front entry to keep the sparrows out of the store which must keep the doors open during business hours. Close up of the BirdBuffer unit above the front door. The EPA classifies it as a naturally occurring flavorant. As an example - Think of the the taste of a grape Jolly Rancher or other grape candy that's M.A. it's used to give the candy a grape taste. NOTE: MA, used in chewing gum and candy, is measured in PPM, and contains 2200 PPM. Bird response of the reduced size fluid (called Nano-Particles) in the Bird Hazer System is less than 5 PPM. Higher concentrations are not necessary if the automated cycle constantly introduces new and fresh nano-particles in the air the birds frequent. The Pigeon Hazer System can be used indoors at public facilities where birds have been a problem in the past. It can also be safely used around people, animals, or inside warehouses that may be storing food stuffs, which normally attract birds. When the haze from the nano-particles are evenly distributed it is easy to get even coverage when and where you need it, without using much chemical. Since the haze is designed to work only with birds, it is logical to have it placed up high where the birds tend to fly. After several exposures to the haze the birds generally leave the area completely and do not return for the season. The automated hazing system inhibits any future re-infestation from new bird populations and assures a total bird free environment. As birds fly in, they inhale just enough haze to realize they don�t like the feeling, it�s not comfortable, and they leave. Nano-Particles from the Pigeon Hazer works to repel birds, while in flight. The best time to use it is when birds are flying in, before they come in to roost, or sleep for the night. While in flight, birds breathe faster, and therefore the haze is inhaled at a faster rate and is effective. When the Pigeon Hazer System is turned on, haze is emitted immediately. No need to wait for warm up time. The tiny nano-particles of haze from the Bird Hazer are so tiny, less than 10 microns, they get into the birds breathing system much further than ordinary fog. A non-harmful, temporary, irritant, birds cough and they don�t like. Because of this, they remember this irritation much longer and stay away, warning all of their friends not to go there. Sometimes they stay away for very long periods. Other times they come back to try again. But soon their memory will keep them away for months. Curiosity: Birds are naturally curious and will always want to venture into a new area to see if there is food or shelter. Once they have located a good spot, they tend to stay. If you haze the area long before the birds want to fly into the area, they will not like the �smelling salts effect� when they fly inside and they will immediately leave. When the birds are attempting to come back in to see if their warm spot is still a good spot, the birds will again smell the odor and feel the �smelling salts effect� of the grape haze. After two or three exposures, they will not want to �try it� again. Months later, they may �try it� again, but once they associate the �smelling salts effect� again with the location, they will not return. Newer flocks or migratory birds may want to �test the site.� If a little bit of grape haze is present when they are flying, they will breath it and get the �smelling salts� effect. They will fly to another location right away. If it not a comfortable spot while they are curious, they won�t stay. AviHaze and Bird Mist control flying birds in open spaces by creating an aerosol haze of Fog that is invisible to the human eye and has a faint grape fragrance. Both the AviHaze and Bird Mist systems are non-lethal, they control birds via behavior modification when they come in contact with the haze produced by the unit. The bird hazers sweep birds from the treated area without impacting the use or operation of the facility for humans or other animals except birds. The AviHaze system - is a modular system, the components are easily placed where you need them, and often the compressor is hundreds of feet away in an equipment enclosure. A small building might use one AviHaze module, open air patios/ eating areas many need 2 or 3, large industrial plants or public attractions could place dozens of modules depending on the coverage needed and the type of bird you are trying to evict. The nozzle installed on each AviHaze module has been in use for over 10 years, creating the small 5 micron-sized drop required to provide the best deterrence influence. The Bird Mist system - is an advanced fogging system that releases a grape-scented mist into the air to deter pest birds from large open spaces. The unit distributes methyl anthranilate, a grape extract proven to be effective in repelling pest birds. Birds do not like the scent of the extract and will take flight from the area being treated. Bird Mist can be used in places that are generally hard to treat like garages, factories, airline hangars, courtyards, landfills, parking lots, or any open spaces where birds are a problem. 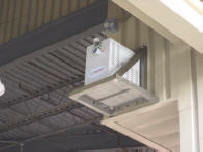 Bird Mist is the only fogging unit which has an LCD touch screen for programming. From the control unit, you can attach up to 32 misters, controlling each one individually. Spray units can be set to go off simultaneously or at alternating times. The control panel will keep track of liquid levels, and will notify you when to refill the units. BirdMist can be programmed to fit any schedule, and can be operated from a distance. The nozzle design on the unit provides a verifiable �5 micron particle size�, meaning this system is the first fogging unit not to leave a residue behind. The nozzles are adjustable, letting you direct the mist toward problem areas. 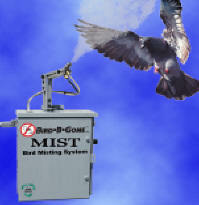 Bird Mist is a revolutionary new tool in Bird Control, and the first to offer programmable components and a computerized touch screen.